Spying, Indefinite Detention, and Dirty Wars: How Will You Respond To U.S. Crimes? FRIDAY, June 14: Stand with Edward Snowden, Free Bradley Manning, Hands Off Julian Assange! FRIDAY, June 14: Close Guantanamo NOW! Where: 2828 N. Clark, in front of the Landmark Century Theatre We will NOT be at State & Jackson this week. Instead, as the hunger strike reaches Day 128, we will be inviting people attending the premiere of “Dirty Wars: The World Is A Battlefield” to support the hunger strike and demand that Guantanamo be closed NOW! Join us there! It is more important than ever that we “Don’t Forget the Hunger Strike,” (Andy Worthington) as some may be lulled into thinking (again!) that Pres Obama will keep his empty promises. It is now three weeks since his speech and not a single man has been released from the torture camp. Instead, more are being forced fed (a form of torture) so the Obama administration can avoid having more prisoner deaths on its hands. Where: 2828 N. Clark, Chicago – Landmark Century Theatre Don’t miss this groundbreaking new documentary, “Dirty Wars: The World Is A Battlefield.” You won’t want to once you watch the trailer here. Save the Date: Wednesday, June 26 * Amnesty Summer Concert On International Torture Awareness Day, World Can’t Wait will be tabling at Amnesty’s Summer Concert, featuring great young bands at the Bottom Lounge, 1375 W. Lake, 7 – 10 pm, all ages. Tickets just $5. See you there! Save the Date: Sunday, June 30 * Join the “Free Bradley Manning” Contingent at the Chicago Pride Parade! More details soon. 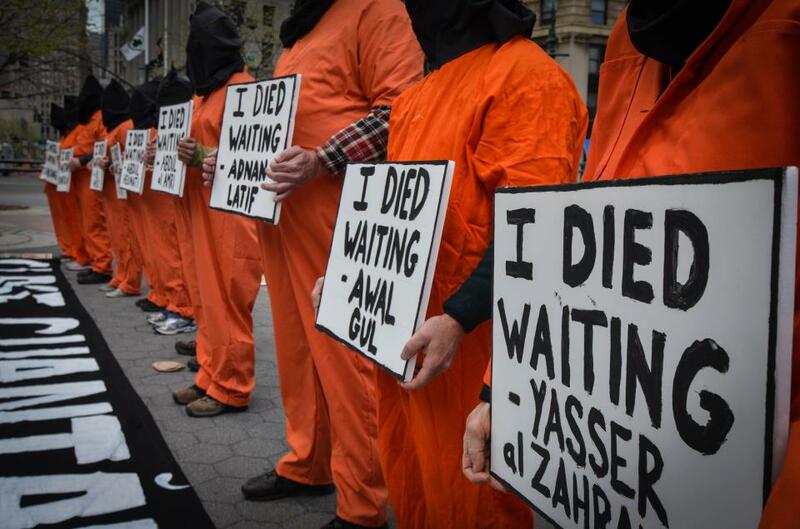 Day 126 of the prisoner hunger strike at Guantanamo: Still no prisoners have been released. Indefinite detention is the status quo under the Obama administration. Our message “Close Guantanamo NOW” is more relevant than ever. It appeared in the NY Times on May 23 and will appear in the July issue of The Progressive. Sign the statement here! Donate to spread the “Close Guantanamo NOW!” message! More than half of the $60,000 raised to date has been from donations of $50 or less so, yes, every dollar counts! Thank you!